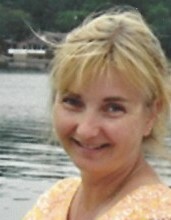 Melinda Cummings of Akron passed away suddenly on January 21, 2019. She was born on August 16, 1966 in Batavia, New York to the late Douglas and Felicia (Pacer) Lotz. Melinda was a 1984 graduate of Akron Central High School. She married her high school sweetheart, Darin Cummings on September 28, 1985 and they had two children together. Melinda enjoyed having garage sales, taking long walks, and camping. She was an expert at out fishing all of her family, and making some of the best food you'd ever eat. Most of all, Melinda was a devoted caregiver to all of those she loved. She is survived by her beloved husband, Darin Cummings and loving children Samantha and Fox Cummings. Her brothers and sisters, Raymond (Rita) Lotz, Dennis (Jackie) Lotz, Denise (Doug) Lewis, and Barb (Thomas) Nichols and many nieces and nephews also survive her. A Celebration of Melinda's Life for family and close friends will be held on Saturday, January 26, 2019 from 2 - 5 p.m. at the V.F.W. Post 3180, 35 Lewis Rd., Akron. NY 14001. Casual dress would be greatly appreciated. In lieu of flowers, please make a donation to your charity or animal shelter of choice in her honor. Thank you very much.